Our group’s next tabletop RPG foray will be into the default 13th Age setting including the perils of the living dungeon in The Eyes of the Stone Thief. The party is shaping up to include Justinian the righteous Paladin, Beast a ‘failed’ experiment between the Archmage and the High Druid (perma beast form druid), a monk and a dwarf-forged ‘sorcerer’. To this mix I am bringing: Impregnate Leaph, Petalate Seal Maiden for the Order of the Wild Rose. She is 6 months pregnant with the child of the High Druid (male in our world) and is off on a pilgrimage that will doubtless lead into the heart of the Stone Thief. Leaph is talented in the ways of healing magic, but her power is really escalating as her child grows. 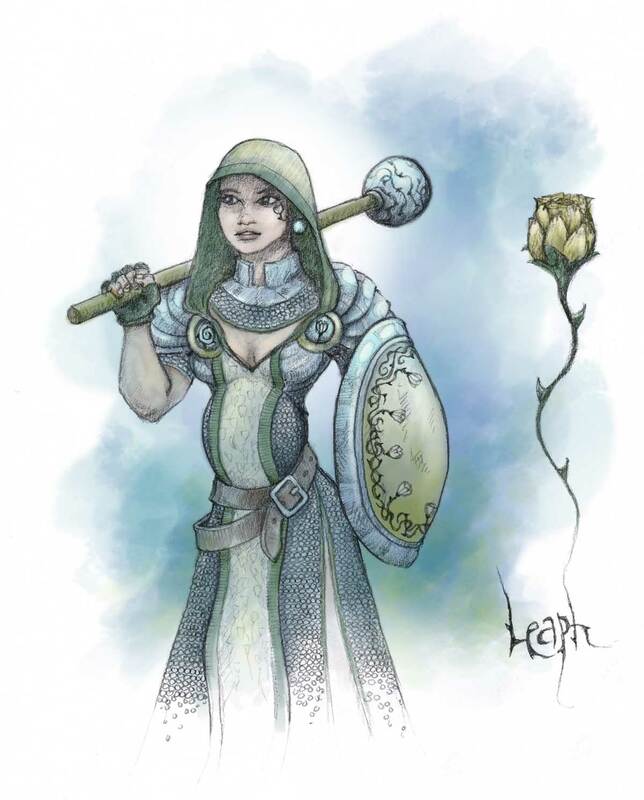 As a level 4 Cleric she is bringing a whole suite of healing and protection for herself and the group. Lots of hooks and unknowns in Leaph’s past and future – should be fun. Never played or seen a pregnant character before, so should be entertaining as she has her cravings and endeavours to protect her tummy during the fight sequences. Here is the current pic for Leaph, done as pencil on paper with a bit of quick photoshop colouring added underneath.